This 30-day journal—complete with personal quotes by Natarsha from her own personal journey—equips you with the courage and energy to reach higher heights. You’ll be motivated to take action in your own life and look within to identify the triggers and personal obstacles that prevent you from living your dream. The entertainment business is a hard business to survive in. It takes a strong mind and great work ethic. You can’t be lazy. You can’t make excuses. This business doesn’t wait for you. You have to run after your dream. The good news is I have a solution to help you succeed. Through a unique and focused method, I draw the gift from within you, which inspires you to win! This weapon is a game-changer and it is your gift. Whether you’re an entertainer or simply a dreamer, this journal is for you. 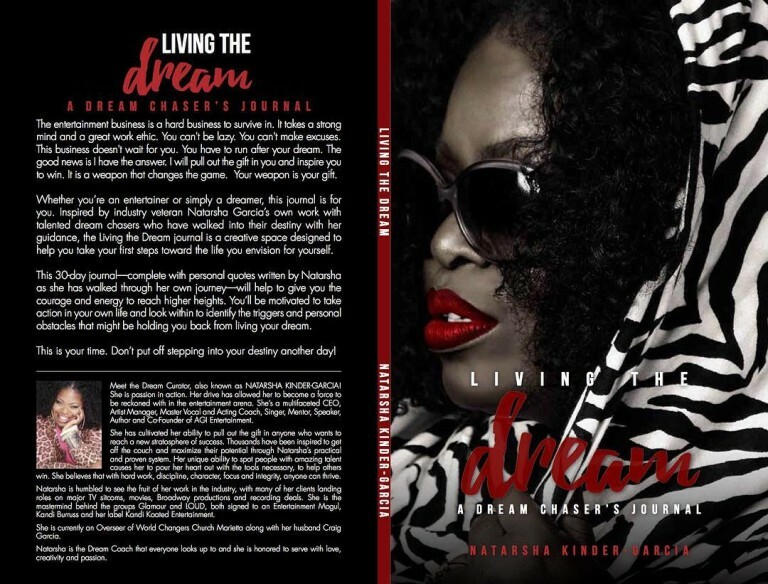 Inspired by industry veteran, Natarsha Garcia’s, own work with talented dream-chasers who walked out their destiny using her plan; the Living the Dream journal is a creative space designed to walk you through your first steps into the life you envision.